Penelope credits her mother as one of the most influential people in her life. 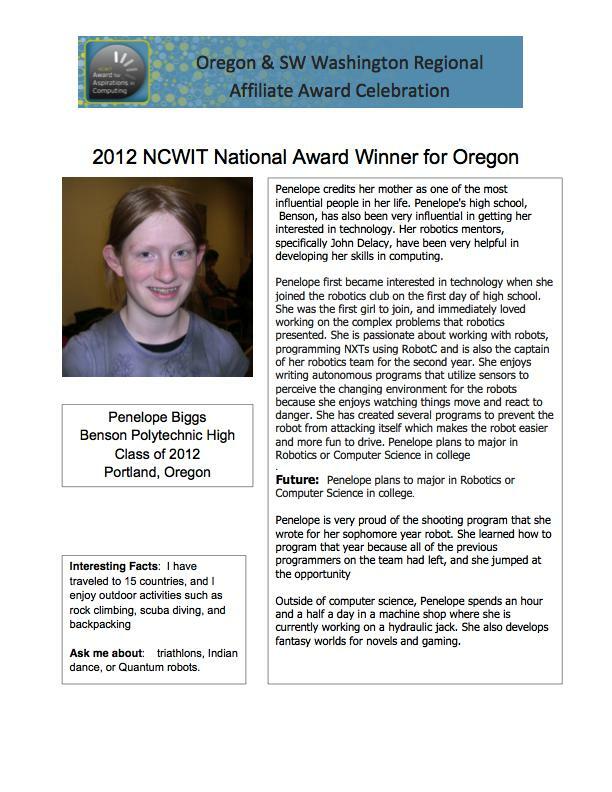 Penelope’s high school, Benson, has also been very influential in getting her interested in technology. Her robotics mentors, specifically John Delacy, have been very helpful in developing her skills in computing. Penelope first became interested in technology when she joined the robotics club on the first day of high school. She was the first girl to join, and immediately loved working on the complex problems that robotics presented. She is passionate about working with robots, programming NXTs using RobotC and is also the captain of her robotics team for the second year. She enjoys writing autonomous programs that utilize sensors to perceive the changing environment for the robots because she enjoys watching things move and react to danger. She has created several programs to prevent the robot from attacking itself which makes the robot easier and more fun to drive. Penelope plans to major in Robotics or Computer Science in college. Future: Penelope plans to major in Robotics or Computer Science in college. Outside of computer science, Penelope spends an hour and a half a day in a machine shop where she is currently working on a hydraulic jack. She also develops fantasy worlds for novels and gaming.